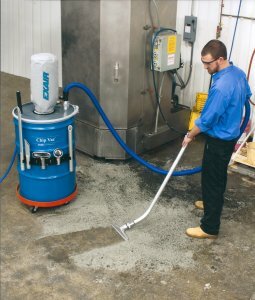 Exair's new Premium Chip Vac System comes complete with a 30, 55 or 110 gallon drum, ready to use for your specific applications. The Chip Vac is used to clean chips or other dry materials from fixtures, floors and work surfaces of machining centers, lathes, saws, mills and other industrial equipment. It can easily be moved from drum to drum to keep different materials separate for recycling. The Premium Chip Vac is compressed air powered and attaches to the included drum. It is extremely quiet at 77 dBA, making it suitable for a wide variety of applications. There are no motors or impellers to clog or wear out. It is covered by a five year warranty. The YouTube name and logo are copyright of YouTube, LLC.